The key figure to what [I] could call the coalescence of the Antichrist legend is a monk of the 10th century named Adso, a French monk. And he writes a famous letter on the Antichrist to the Queen of France, in which he summarizes all the ancient traditions from the West about Antichrist. But he does so in a very interesting form. He uses the form of a saint's life, a saint's life in reverse. And I think we have to remember that saints' lives were the movies of the 10th century. It was the most popular form of literature. ... It was the form that Adso used which made his famous letter on the Antichrist such a important document in the history of apocalypticism. Hundreds of manuscripts of this survive, translations into vernaculars, etc., etc. The Antichrist is not mentioned in the Book of Revelation. How at this time does an idea about the Antichrist begin to form? The term "Antichrist" doesn't occur in the Apocalypse. It only occurs in the epistles ascribed to John in the New Testament. 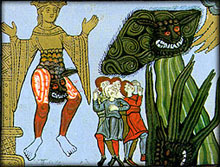 But nevertheless, the image ofx the beast, particularly in the 13th chapter and later in the 17th chapter, was always interpreted as a symbol of Antichrist in Christian tradition. Antichrist traditions then are very powerful throughout the history of Christianity. What made Adso in the 10th century so important is that you have an easy, comprehensible picture of Antichrist, his whole life from birth to death, presented to a general audience, and if you will, therefore solidified for popular appeal. Hildegard of Bingen is very significant because it reminds us that the history of apocalyptic expectations is not just a male phenomenon in the history of Christianity ... and her unique view of the theology of history and of the end times, the picture that she has of the Antichrist, for example, as part of this play or scenario, is one of the most inventive of the entire medieval period. Well, Hildegard of course gives us several pictures of the end times. But the one that was most .. powerful, I think, is the picture in her book Scivias, the visionary book that she wrote in the 1140s. And this is a series of visions, many of the connected with the heavenly world, but others dealing with the course of history. One of these famous images is the picture of the kingdoms of the end time and the birth of Antichrist from the Church. This is a powerful image of a vast female figure representing the Church, with this horrible monstrous head being born from the woman. And that of course is the image of the Antichrist, who will be born from the Church, who will persecute believing Christians, and who will try to pretend that he is divine by ascending into heaven. And so in the image you have this monstrous head on the top of a mountain, and then being cast down and destroyed by divine power from above. What role does Hildegard ascribe to Jews in her version of Antichrist? Hildegard, like many others, pondered the role of the Jews in the end times. And often basing themselves upon Paul's prediction of the Jews returning to Christ in the Book of Romans, many later commentators saw the Jews as coming into the Christian fold at the end times. And I think that we have to put Hildegard within the context of continuing Christian speculation about the role of the Jews at the end period. Does she associate the Jews particularly with the Antichrist? No. For Hildegard, Antichrist is born from the Church. That's very crucial. Because there are two traditions really in Christianity, at war with each other for many, many centuries. One is that Antichrist will be born a Jew. The other one is that no, he won't be a Jew; he will be born out of the Church. He may convert the Jews briefly to himself, but many also believed that the Jews then, even the ones who were converted to Antichrist, would repent before the doomsday. Is there a mirror image she sets up about the birth of Antichrist and the birth of Christ?